Guru Kula an ancient educational system that was in vogue in the old Indian culture, wherein students go to teacher’s place to learn their disciplines by observing the teacher, and learn how to educate their own self and develop holistically into well-balanced human beings, both mentally, physically and psychologically. 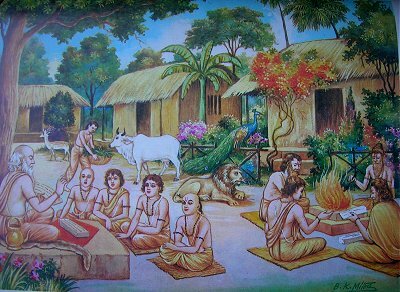 The ideal of a guru-kulam, literally, the Guru’s house – The ancient guru-kulams were forest academies where the students were admitted at young age to study and practice their disciplines for as long as it tool to master an area of knowledge, Guru Kula education can be imparted only under the guidance of a learned teacher who has undergone the disciplines necessary to qualify as a guru. The Gurukulam is a traditional way of teaching the students who have a great interest in music education, who wants to experience the culture, tradition and its roots in its real environment. Teacher or guide will share their musical knowledge in creating the next generation musicians in traditional old-fashioned manner. Provide platform by creating opportunities to all sashays or students to perform musical concerts. Who in turn will become teachers or guides in the near future and train the next generation musicians. Spring Nectar Academy strongly supports the Indian Music education for the students living in the USA. Apart from their regular weekly music lessons, SNA creates opportunity to learn, preserve and appreciate their traditional music in more personal and old fashioned set up in these Guru Kula Camps. The Annual Summer Heritage Camp has received a wide acclaim and appreciation from the students and parents for its educational values, teaching methodologies, performance strategies, and community outreach. Over few hundred students have benefited and enjoyed the fruit of the GURU-KULA CAMP over the past 15 years, and the compositions offered at the camp has still been performed by them in several community occasions and stage performances. 1. Learn about 8 to 10 compositions in Carnatic trade with in one week Camp. 10. The US born children with Indian Roots find a venue for learning about their own custom and heritage and have a wonderful learning and cultural experience.